Netanyahu not pleased with deputy minister’s slam over interim agreement. 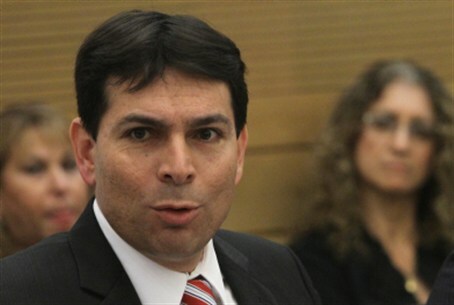 Prime Minister Binyamin Netanyahu has reprimanded Deputy Defense Minister Danny Danon for his criticism of a potential interim agreement with the Palestinian Authority, Channel 2 news reports. A recording has surfaced in which Danon called to expel from the Likud party any person who seeks government approval for an interim agreement with the Palestinian Authority. During a closed conference for Likud members, Danon strongly criticized the idea of establishing a PA state in temporary borders, under an interim agreement. “What would happen if, Heaven forbid, the negotiations result in an agreement, and the Prime Minister would bring the agreement to the government for approval? We’re talking about an interim agreement,” he said. “If an agreement like that comes [before the government] – the Likud movement needs to say that whoever supports an agreement like that, does not belong in the Likud,” he concluded. His comments were interpreted as a warning to Netanyahu. Danon has reportedly claimed that his statements were taken out of context.